As Windward’s Dance Company rehearses for its upcoming Evening of Dance, students are turning to a familiar face to prepare: Windward alumna Katia Kupelian ’15. Currently attending the University of California-Berkeley, on Dec. 8 Katia was on hand to discuss her own time at Windward, as well as how her dance career has progressed since graduating from the School. 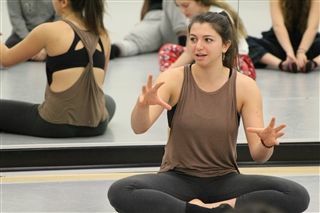 She also ran through rehearsal with members of the Upper School Dance Company, whom she’s worked with over the last week in choreographing an original work that will premiere Saturday, Jan. 27. As part of Windward's first-ever An Evening of Arts, an interdepartmental collaboration showcasing students’ work across multiple mediums, it’s fitting that in Katia Windward has collaborated with one of its own. You can RSVP for the event by clicking here.